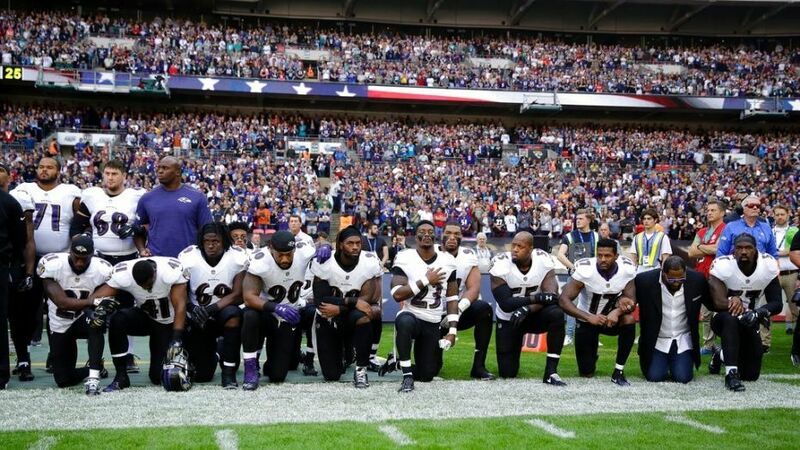 If you’re an NFL player these days, it’s cool to kneel for the national anthem, or if you’re the Pittsburgh Steelers, not come out of the locker room. If you’re a millennial and you care at all about being cool and “woke”, you’re supposed to swallow the Kool-Aid and cheer on these heroes in their bold endeavor to bring social justice to America. I don’t care about being cool and woke, so allow me to say how I view this. The problem with your problem is that it’s not a problem at all. There is no systemic racism in police departments across America. Most of the martyrs for your cause were criminals who were trying to kill police officers. That’s not racism; that’s self-defense. That’s totally justified. I’ve written about this before. About 75% of these men died because they were trying to kill a police officer. Don’t take that to mean that there is no racism anywhere nor discrimination. There are 312 million people in America. Naturally, some of them are racist. Some of those racists are police officers. But overwhelmingly, it’s not an issue. What is an issue is the cycles of poverty and fatherless homes that lead some black teens into crime. Also, the issue is morons that feed the lies to children that there can be no racial harmony and police forces are discriminatory. In terms of racist police: you all are kneeling for a lie. Furthermore, you millionaire idiots, we all have problems with America. Government is not perfect. Society is not perfect. If you’re waiting for that, you’re going to be kneeling for the rest of your lives. I’ve been on seven mission trips around the United States exposing the harsh reality of what abortion is to a complacent society. You think that hasn’t led to frustration? You don’t think me watching Jackson, Mississippi police watch people steal our property while doing nothing about it didn’t breed cynicism? Or when a friend was assaulted? Or when a business owner went chest-to-chest with me in Columbus? Or when I was featured on the blog of an abortion mill in Columbus (which was actually amusing, I thought). There have been 56 million humans murdered since 1973 in this country. Of course there are things wrong with America. I think allowing gay marriage is not good for society, yet the Supreme Court legislated from the bench again and forced every state to accept it. I think the trend to accept transgenderism is ridiculous. Conservatives were targeted by the IRS. Government wastes billions of dollars a year of taxpayer money. My first presidential election in which I was eligible to vote featured Hillary Clinton vs. Donald Trump. If that doesn’t make one cynical, I don’t know what will. And speaking of Donald Trump, yes, he’s a moron. Yes, he opines about things he shouldn’t opine about and puts his foot in his mouth. I voted third-party, so don’t blame me. But using the president, however foolish his statements are at times, as an excuse to disrespect the national anthem and the flag is like you going out and spitting in a homeless man’s face because I hurt your feelings with this post. The conclusion doesn’t reasonably follow the premise, not that I expect logic from people anymore. All of those issues I mentioned matter to me. However misguided at times, I understand that racial issues matter to you. 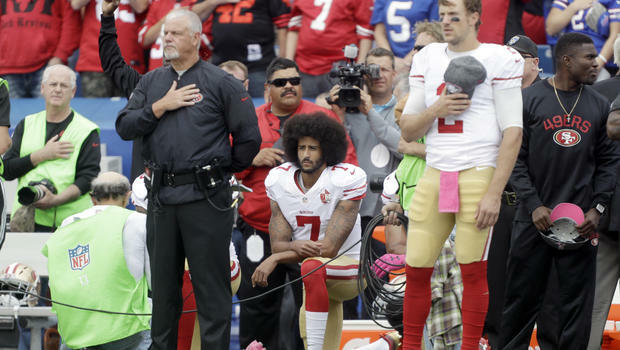 Even granting that your cause is legitimate, that’s still no reason to kneel for the anthem. For one thing, you are on national television and have children watching your conduct, wanting to be like you. You should be ashamed of yourselves. The national anthem isn’t played because we agree with everything that happens in our country. It is played because we are devoted to a country that enjoys liberty. That means you have the liberty to look like an idiot. But you are literally protesting the symbol of your liberty to protest. 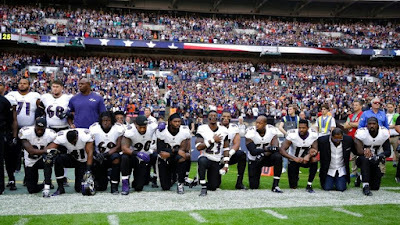 We show respect for the anthem because it is representative of the 42 million Americans that have served in the military during wartime and the 1.2 million who have died. They were protecting your freedom to look like an idiot. It represents the police—those violent, racist police—who put themselves at risk every shift to protect Americans—including being security for idiots like you during games. It represents the opportunities afforded to people who come to this country. 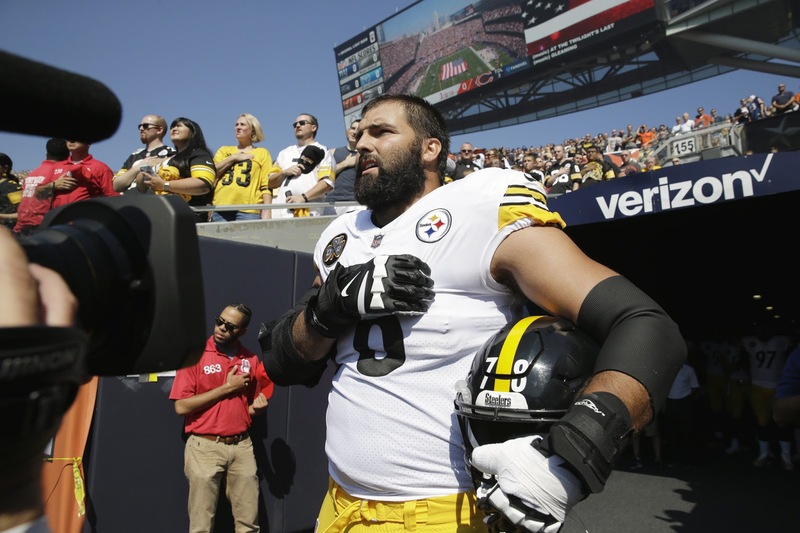 That’s why Alejandro Villanueva was the lone Steelers player to walk out and stand with his hand on his heart. He’s a first-generation immigrant who served as an Army Ranger. He knows what opportunities are in America, and he knows what it is to sacrifice for America. We all have things we don’t like about America. But we have the liberty to say that. We have the liberty to choose our leaders, even if we don’t always do a great job of it. We have people who fight for our liberty and serve for our protection. We live in the Land of Opportunity. And we can be united as Americans behind symbols of being Americans. Speak up about these issues if you want. Whine about the president. Say what you want. But kneeling for the national anthem, or raising a fist, or not showing up, or whatever attention-grabbing ploy you want to do, is disrespectful to those that have sacrificed and to the freedoms we enjoy. And you look like an idiot when you do it. We continue with the second half of Ten Things Christians Should Be Talking About, But Aren't. Read the first half here. Knowledge of the Bible can actually be counterproductive if it is not accurate. Parts of the Bible can be easy to misinterpret—and many churches teach their own interpretations apart from what God says. Where Christians, both true Christians and those who claim to be, fall short is in looking into what a passage truly says. This involves looking at the passage as a whole, not just reading one verse and deciding its meaning. (And, in the case of some religions/denominations, building their entire faith around that.) It means looking at the historical context—who it was written to, why it was written, and who the author is. Commonly, James’ teachings are interpreted to be teaching a works or partial-works salvation, while ignoring that His audience was professing Christians. It involves cross-referencing by comparing scripture with scripture. James says faith alone won’t save us (speaking of a professed faith), but comparing that to the words of Paul, Jesus, Peter and others tells us that it is faith alone that saves—hence, James must be referring to something different. The born-again love to quote Jeremiah 29:11 as if it was God just throwing it out there for us to be encouraged by. In reality, the verse comes in the midst of a letter telling Israel their captivity will last seventy years, in contrast to a false prophet claiming it would be two years. Christians look at the verse like Hannaniah, the false prophet. “God is going to work in my plan to bring me what I want to do and be. And it’ll be soon.” Completely wrong. As the following verses tell us, God will move when the people become right with Him, and He most definitely has a plan for them. But that is HIS plan and it will happen when and how HE wants it done. When we ignore what a passage is referencing, we are in danger of at least misleading Christians, if not leading others and even ourselves to damnation. Context is crucial, and cannot be ignored by God’s people. There are various excuses Christians give as to why they ignore the Old Testament. Some believe it is no longer relevant. Some believe it’s not useful for the church age. Some even believe it is all made up, just a long story with symbolism. None of these are true. From the beginning, yes, even a literal six-day creation, the Old Testament teaches us the history of God’s people through whom came Jesus Christ. The New Testament is very clear on its relevance. The Old Testament is there to teach us. What did the people do right? Imitate it. What did they do wrong? Stay away from it. How did God behave? He still behaves that way now (I realize I pushed wrath, but God was quite merciful to Israel). It goes beyond that. 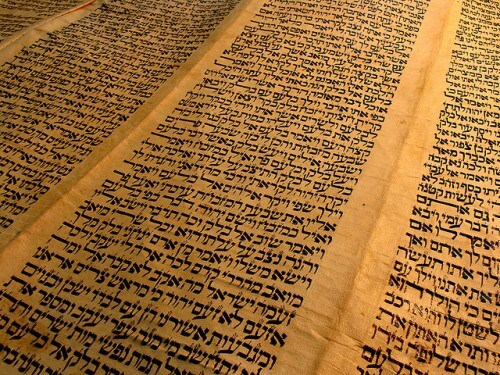 There are around 2500 prophecies in the Bible, the vast majority being in the Old Testament. The Old Testament gives the Bible validity, as 2000 of those prophecies were fulfilled, centuries after being prophesied. There are hundreds of quotes of the Old Testament in the New Testament—a number of which were said by Jesus Himself. If Jesus and the New Testament writers found the Old Testament important, we should too. The Old Testament law seems to be particularly ignored. “We’re not under the law.” True, Christians aren’t, but the lost are. Until we are dead with Christ in salvation, we remain under the law. The law warns us by telling us what is acceptable and what is sin. Without the warning from our “schoolmaster” (Galatians 3:24), there would be nothing to show us our sin and the need for One who can expunge them. The law shows us that we are sinful. Because no one can follow the law, it shows us that we need One who can. Jesus is a fulfillment of the law, and is the only One who could be. The law also points to Christ. Particularly-picked-upon Leviticus explains five sacrifices, each a symbol of a different way in which Christ was the ultimate sacrifice. It also tells us how we must sacrifice ourselves. Don’t miss the importance of the Old Testament, nor the law. They are in scripture and they serve a purpose. Study it, learn it, and speak about it. Ask many Christians if they are good people, and they might just tell you “yes”. Such a thought, though seemingly harmless, strikes at the heart of one of the world’s greatest problems. We underestimate just how evil humans can be. I would say a majority of America, Christians included, would probably say something like, “I think people are generally good. I believe most people try to do good things, only occasionally mess up.” Society believes, wrongly, that evil actions are isolated instead of out of an evil nature. God has something very different to say. The Bible plainly tells us that people are inherently bad. Sure, we are capable of good things, even outside of Christianity, because our God-given consciences tell us general right and wrong. But when it comes to humans as a whole—well, we are an evil lot. The Bible tells us that we are all sinners and, therefore, do not meet God’s standards for righteousness. But just how bad is our sinful condition? God has his Himself, ready to consume us because of our sin. And “our righteousnesses”—the very best we can offer—is like filthy rags to God. The Hebrew words for “filthy rags” has the connotation of menstrual rags. Yes, that is what our very best we offer is to God. That lays it out better than I could. There is a price for sin. Period. Now the price for sin is brought upon the lost with God’s wrath, but on the saved by His love. When does a parent discipline their child? Hopefully, when the child has done wrong. And that punishment will eventually teach the child to stop doing what is wrong. In the same way, God works with His children. When we fail Him, He punishes us, not out of anger, but out of love, so that we don’t continue to stain and harm ourselves with sin. Those that willfully broke Moses’ law were put to death. 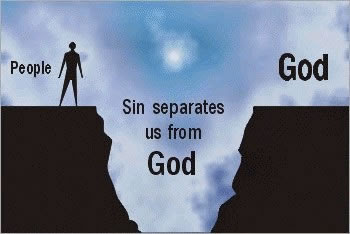 But when we sin we trample on the very blood of Jesus that saved us by counting it useless to deliver us from sin. Jesus is coming, and we are not to draw back and become counterproductive for God’s cause and glory, but are to believe and serve Him. Chastening is not a bad thing, it is a necessary thing. We stress God’s forgiveness for our sin, and He is so long-suffering with us, even those that are backslidden. But know that there is also a price for sin. There is chastisement on Earth, and God will call all of our actions into judgment in the end. Christians often refuse to get involved with—yea, hardly acknowledge—the most polarizing issues in our country. They don’t want to be involved in politics. They don’t want to offend anyone. They may even have believed the liberal garbage that “the church has no place to take a stand in ‘political’ issues.” Jesus, who Himself was a hot-button issue, would have a different stance. I don’t believe the church should jump straight into the middle of politics. I believe that the members of the church should hold informed views, and believe, as Thomas Jefferson and the founding fathers truly intended it, that the nowhere-in-the-Constitution “separation of church and state” is to keep the state out of the church, not the church out of the state. Don’t be scared out of taking a stand. And there are some issues that Christians need to take a stand on. Many of these issues would not be political except for the Left’s rewriting of laws, which then helps them claim that “churches shouldn’t hold an opinion.” But for anyone that cares about the direction of our country, whether revival or a train wreck is the goal, we should care about hot-button issues. And church membership should not and must not prevent that—nor should biblical beliefs be compromised on the basis of keeping the church from influencing the government (which was never the intention). Oddly enough, many liberals too are members of churches, but fellow Leftists have no problem having their influence in government. But before I the soapbox gets going down the hill, I will address why Christians should talk about the issues. 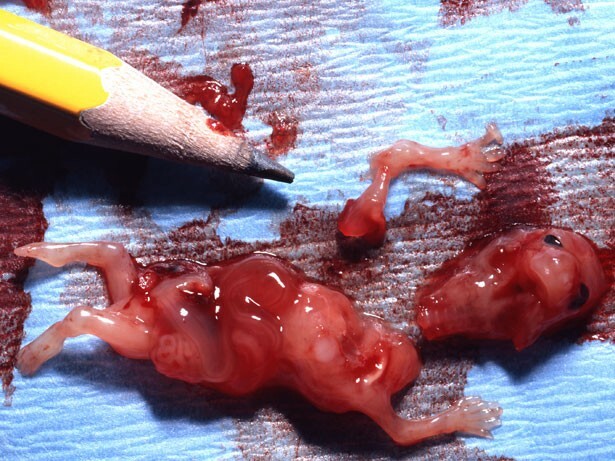 “News flash, American church: Jesus is against baby-killing.” Mark Harrington, Executive Director of Created Equal, has been an inspiring influence in my life, and speaks as to why abortion is not just an issue, but a gospel issue. First, a pro-life view stands in contrast to dangerous worldviews that tell us human life is invaluable, if not directly, then by the obvious results. One part of the secular worldview is Evolution, which summarized, states that humans are just the most advanced animal and our creation was an accident—which consequently gives no value to human life. But God created us in His image, standing out from all other creation. Hence, as He values us, so should we value human life. Being pro-life is also a gospel issue, Harrington says, because it gives the church legitimacy. Who takes seriously the German church in the 1930s and ‘40s while they turned a blind eye to Nazi practices? Or the Argentine churches in the 1970s while the Dirty War claimed thousands of lives? In the same manner, who will take America’s churches seriously if they don’t stand up for the group who can’t stand up for themselves? We know the biblical truth. We are commanded not to murder. The Bible speaks of John the Baptist by saying Elizabeth conceived a son (Luke 1:36) and bare a son (Luke 1:57). He was her son from the beginning. What’s more, the baby leapt in her womb when he was near Jesus in Mary’s womb (Luke 1:44, 47). Job 3:16 uses this terminology to describe the preborn: "Or as an hidden untimely birth I had not been; as infants which never saw light." I could go on, but this point isn’t solely about abortion. Anyone informed and with an unseared conscience would be against this barbarism. When we know there is something so wrong in our nation, we have to speak up. We must be willing to get involved, because God cares. Don’t let liberals make this political; this is a case of basic moral truth. Unfortunately, as much as abortion has been an issue is now gay marriage. This seems to catch even more Christians in a trap, as people who don’t even believe the Bible use Jesus’ command to “judge not” on them. As if somehow sharing God’s truth is casting judgment on someone. We don’t need to judge: God already is. But the recent push by the Pride Police to take away churches’ exempt status if they weigh in on a biblical commandment has some people, including pastors, scared. Even worse, there are self-proclaimed Christians who are actually condoning gay marriage, either feeling the alternative would be judging or, even more baseless, that the Bible too condones it. Not a very good view of homosexuality from God, is it? No, nowhere does the Bible condone homosexuality. And for greater clarification, none of these verses are in the Old Testament law. Furthermore, God designed marriage between a man and a woman before the law, and Jesus, who “never talked about homosexuality”, reinforces that. Who needs to call out homosexuality when the true design is so clear? We are not to condone, not even to ignore, but to expose. And if it was spoken of in scripture, it should be spoken of by us. These issues are far from the only prevalent issues we should be speaking about, but abortion and sexuality are at the forefront, as these are often what Progressives leverage in societal change. Striking at the heart of the biblical family strikes at the heart of society. Societal change and values begin in the home. There is a great danger in Christianity today in that we are unwilling to address issues we believe are difficult, or will not be well-received by the world. Look at Jesus. He wasn’t exactly the most popular teacher. In fact, they killed Him for what He taught. But He spoke what was necessary, and the Bible speaks what is necessary. We just have to have the boldness to do so and the lives to back it up. Only then can we truly be effective for God, instead of worrying whose toes we might step on. The world is full of people that need to be offended with the truth God has given us. Will we cower in fear, or share it? I have heard the saying that if Jesus were walking the Earth today, He wouldn’t recognize the things He said. I find that painfully true. Jesus didn’t cut corners or back down: why do we? Rightly divide the word of truth (II Timothy 2:15), and be sharing it, whether it is easy and fun or not.